Jesus teaches the people that God looks at the heart of the giver, for God saw that the poor widow gave her all because she loved him. HILE JESUS WAS teaching in the temple he told the people by a parable that the kingdom of heaven is like a king who made a feast at the marriage of his son. The king prepared a great feast and invited guests from a city near by. When everything was ready, the guests failed to come. He sent servants to remind them of their invitation to the wedding-feast, still they would not come. They made fun of it, and went on about their own work. Some of them even treated the king's messengers cruelly and killed them. The king heard about the conduct of those people, and he was much displeased. He called out his army and sent his soldiers to destroy them and to burn their city. Then he invited other guests to the marriage feast, and the place was filled; for every one came who was bidden this time. Among these guests were the poor and the rich, and the good and the bad, and the king furnished each one with a garment to wear. He wished to have them appear well in his presence. When all had arrived and put on their clean garments, he came in to see them and give them a welcome to the feast. One man was present who refused to put on the clean garment that the king had provided for him. There he stood among all the others, clothed in his dirty rags. The king saw him and said, "Friend, why did you come in here without putting on the clean garment that I had provided for you to wear?" And the man hung his head, for he had no excuse to offer. The king was displeased with him because he had disobeyed orders, so he commanded his servants to seize the man, bind him hand and foot, and take him away to a dark place where he should be punished. The Pharisees and other enemies of Jesus knew these parables were showing the people how they, the Pharisees and the other enemies, had refused to obey God, and they determined to put a stop to his teaching. They decided to ask questions of him, and prevent him from teaching in this way. So they sent some men who pretended to be good, and told these men to ask him whether it was wrong or right to pay the tribute money, or tax money, which Caesar, the Roman ruler, demanded to them. The Jews disliked to pay this money, and Jesus' enemies knew that if he should say it was right for them to pay the tax then the people would no longer care to make him their king. They would no longer follow him so eagerly and listen to his words, for they hated the Roman government. But if Jesus should say it was wrong to pay this tax money, then his enemies planned to tell the Roman officers that Jesus was unwilling to obey the Roman government, and they knew Jesus would be punished. So the men came to Jesus and said, "Master, we know you are true, and that you teach the way of God in truth without caring whether men will be pleased with your teaching or not." Thus they flattered him, thinking he would be delighted to hear such favorable things said of himself. Then they continued: "Tell us just what you think, Is it right or wrong to pay this tribute money which Caesar demands of us Jews?" They thought Jesus would answer either yes or no. But they were mistaken. Jesus could see the hearts of these evil men who were questioning him. He paid no attention to their flattering words, but said, "Why do you tempt me, you hypocrites? Show me the tribute money." And they brought him a penny. Jesus looked at the coin on both sides, then asked of them, "Whose image is this on the one side? and whose name is written her?" On one side of the coin was a picture of Caesar's head, and his name was written above it. The men replied that the image and the name of the coin were both Caesar's. "Then," said Jesus, "give to Caesar the things that belong to him, and give to God the things that belong to God." This answer greatly surprised the men, for they had thought they surely would catch Jesus in a trap where he would need to say yes or no. But he had replied so wisely they could not accuse him to any man. Others came to question Jesus, and among them was a lawyer who asked, "Which is the greatest commandment of the law?" Jesus replied that the greatest commandment of the law was, "Thou shall love the Lord thy God with all thy heart, and with all thy soul, and with all thy mind, and with all thy strength: this is the first commandment. And the second greatest is this: Thou shall love they neighbor as much as thyself. No other commandments are so important as these two." The lawyer answered, "You have well spoken, for to love the Lord God in this way and to love one's neighbor as much as one's own self is surely more pleasing to God than burnt offerings and sacrifices." Jesus was pleased with this reply of the lawyer. He saw that the lawyer understood the meaning of God's Word better than did many who pretended to be teachers of it. And he told the lawyer that he was near to the kingdom of God. While Jesus was in the temple, some men came to Philip, one of the twelve disciples, and asked permission to see Jesus. These men were Gentiles, they were Greeks by birth, and they had come to worship the God of the Jews, so they were called proselytes. Because they were Gentiles they could not enter the part of the temple where Jesus sat teaching the people who thronged him there. They could come no farther than the outside court, called the court of the Gentiles. But they had heard much about this wonderful teacher from Galilee, and they wished to see him. Philip told Andrew, another disciple, and together they hurried to tell Jesus that strangers from Greece, a country far away, were waiting in the court of the Gentiles to catch a glimpse of him. When Jesus heard about the inquirers from distant Greece he said to Philip and Andrew, "The hour is come that the Son of man should be glorified." He spoke to them about his coming death for the sins of the people, but the disciples could not understand his words. And because Jesus could feel pain just as we do he shrank from the thought of dying on the cross. He felt troubled because the time was drawing so near when he should die. And he said, prayerfully, "Father, save me from this hour." Then he remembered that his life-work would not be finished if he did not die for lost sinners, so he added, "Father, glorify thy name." Then a voice spoke from heaven, "I have glorified it, and will glorify it again." The people standing by heard the voice but could not understand the words that were spoken. Some thought the voice sounded like thunder; others said, "An angel spoke to him." But Jesus said the voice had spoken to prove to them that God had heard him. 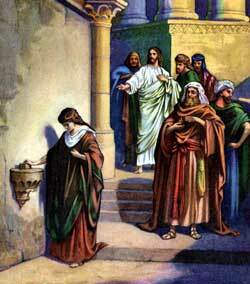 After teaching, Jesus had sat down near a place in the temple called the treasury. Here were money-boxes in which the people's offerings were received. And Jesus saw the rich pass by the boxes and throw in large offerings. Finally he saw a poor widow come into the treasury and stop beside a box to throw in her small offering of only two little coins. Together these coins were worth less than a penny. But Jesus told his disciples that the poor widow had given more than the rich people, for they had given out of full purses whereas she had emptied the last of her money into the box. He wished to teach them that God looks at the heart of the giver, for God saw that the poor widow gave her all because she loved him, whereas the rich people gave their offerings because it was their duty to give. Then Jesus and his disciples left the temple, and went out to the Mount of Olives. Never again did Jesus walk in the courts of the Lord's house on Mount Moriah; for soon afterwards his enemies took him and did to him all they had wished to do.